The Heavy Duty Sink is the upgraded workhorse of the Cashel utility sink line. This versatile, extra-strength laundry tub will handle everything you can throw at it. Made to be durable, this free-standing sink will last. Also available in white! 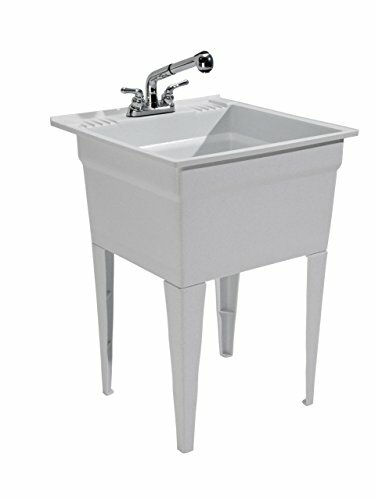 HEAVY DUTY - Extra-strength, free-standing sink with high-impact polypropylene construction. DURABLE - Rust and stain resistant with granite finish. FUNCTIONAL SINK KIT - Includes utility tub made in the USA, legs, leg levelers, a 4-inch pull out faucet, and self-draining soap holders. HIGH CAPACITY - Large 20 gallon capacity. FULLY LOADED - Complete with 4-inch chrome faucet, down plumbing, supply lines, and drain accessories. If you have any questions about this product by Cashel, contact us by completing and submitting the form below. If you are looking for a specif part number, please include it with your message.